Materials: Plastic (polymer) and metal construction. Barrel: 3.3 inches, metal rifled. Ammunition Capacity: 8 shot rotary magazine. 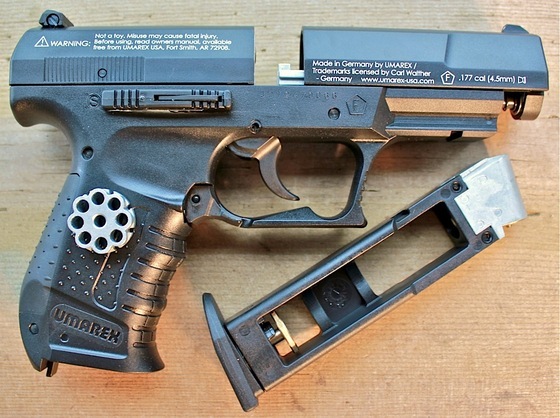 Trigger Pull: The trigger pull on the Umarex Walther CPSport is in the mid range with most of the effort at the beginning and middle stages, it does have a predictable release point making it easy to put pellets on target. The CPSport definitely has a lighter trigger then the Umarex Walther PPQ I reviewed earlier. Accuracy: I shot this air pistol at a target from 20 feet away in a free standing position, and it performed well getting an decent 2 inch grouping just to the left and a bit high on the target. The sights can be adjusted for windage if your aim is off to one side or the other. With Chrony Chronograph testing using 6.9 grain lead pellets I got pretty close to the factory claim of 360fps with an average 8 shot fps of 356. Build Quality: This is an almost all external polymer air gun with a good deal of metal components on the inside giving the Walther CPSport a decent overall weight and heft. It's worth mentioning that the Walther CPSport has a full size drop out magazine for holding the CO2 cartridge that gives the air gun some additional weight and functionality. The fit and finish is very good on the CPSport and the plastic quality seems very durable. Realism: The Umarex Walther CPSport is licensed by Walther and is loosely based around the Walther P99. The frame is very similar to the P99 but the slide is not nearly as accurate. If you want to step up to a closer replica of the Walther P99, then you may want to take a look at the Umarex CP99 Pellet pistol. Purchased this gun in: The Replica Airguns Store. Very reasonable price for a well German made full featured airgun. Can shoot BB's with the Umarex rotary BB magazine. Easy to use white sights adjustable for windage. Slide catch and safety and magazine are fully functional. Even though there is a lot of plastic on the outside, there is a lot of metal on the inside giving this airgun some decent weight and heft. An excellent option for the Umarex CP99 customer on a budget. The plastic exterior may put off some customers looking for metal guns. The slide could have more detail work on it to make this gun a bit more believable. The small .177 caliber viewable barrel port is a bit of a giveaway in terms of realism but may help a bit with fps. The Umarex Walther CPSport Pellet air pistol is a great combination of quality vs price. Even though this gun uses a lot of plastic in the build it still performed flawlessly and looks the part, I did not have a single misfire out of all the 100 shots I took! All the mechanical parts of this gun work smoothly making for a very enjoyable and accurate gun to shoot, giving the shooter the confidence that this gun will work exactly a it is intended to do.